India is expected to see a significant rise in export of tea, but is still debating whether coffee trumps tea as the national drink. West Bengal’s mandate is resoundingly loud and clear. Cha is what the Bengalis call their tea. Cha is not simply a beverage for Bengal; it is a lifestyle. Tea, in India and especially Bengal, has stood witness to a tumultuous history, with the British East India Company having initiated organized commercial tea production for the first time in the country. What was once considered as a drink for the royalty gradually became a staple for the common folk. Cha is barely about the careful selection of the tea leaf for the commoner. It is more about rejoicing the tea culture. “I have the same tea at home in Mumbai, but it doesn’t feel the same!Cha, for me, is habit. The tea tastes like Cha when the Kolkata weather coupled with the ambience of roadside stalls add impetus to it,” says UpasanaDasgupta, a media student who shifted base from Kolkata to Mumbai. Every street in Kolkata has at least one Cha-wala, literally meaning a tea-seller. Be it as late as 2am or as early as 5am, you’ll always find a tea stall somewhere or the other operating with as much gusto as any other time of the day, with a crowd huddled up reaching out for their cups of the magic potion. You’re not a Cha-lover if you don’t lose count of the cups of tea you had all day. With over 450 tea gardens spread across the Dooars, Terai and Darjeeling region, the northern part of West Bengal makes for a tea lover’s paradise. 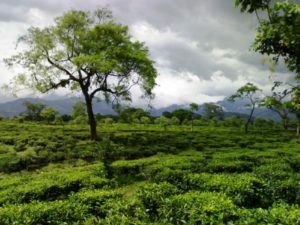 The Samsing Tea Estate, the largest tea estate spread over 1256 hectares and hailed as the Queen of the Dooars, is a picturesque premise for vacationers. It is imperative to visit the Makaibari Tea Estate for all tea lovers. Situated in the Kurseong subdivision of the Darjeeling district, Makaibari encompasses seven villages and has three rivers flowing through its estates, emptying into the awe-inspiring Balason, the primary river of the region. As a part of its wide range of tea products available worldwide, an exclusive product would be the Darjeeling Fullmoon Handmade Tea. Neil Law, founder director of the Himalayan Footprints which is a premier outbound adventure services company based out of Kolkata and also a connoisseur of tea, strongly recommends infusions of green tea with lemongrass, orange or mint available at the Yule Tea Lounge. “I love my Cha best when it comes in a Bhaar(a small earthen tea cup which is very symbolic of Kolkata, available at the myriad tea stalls in every nook and cranny of the city). I like it best when the cha-moment comes minutes after bumping into a friend from another lifetime, invariably followed by ‘ektu Cha hok naaki?’ or ‘ tea, what say?’,” opines Aritra Sengupta, a young playwright from Kolkata. From the first half of 2015 to the first half of 2016, there has been a slow but steady growth in export of tea by roughly 5.76 pc. The recent floods in Assam affected the tea industry as a sizeable produce of tea comes from the state. But, the signs of recovery are encouraging while 2016 promises better returns. Here’s raising a bhaar and slurping to that.